A general view of the ISOLDE Decay Station, during a behind the scenes tour at CERN, the World’s Largest Particle Physics Laboratory, in Meyrin, Switzerland, April 19, 2017. China’s next-generation supercollider will unlock secrets of the universe—and destroy the ideals of the scientists running it. This article was first published by Foreign Policy. “I only asked a very simple, matter-of-fact question about organizational structure,” I said. We were discussing China’s proposed heir to the Large Hadron Collider (LHC), built by the European Organization for Nuclear Research, or CERN. Since its unveiling in 2008, the LHC has been the world center of particle physics research. In a tunnel 17 miles in circumference and more than 500 feet below the surface of the Swiss-French border, the LHC smashes subatomic particles at nearly the speed of light and has seen breakthrough discoveries including the Higgs boson. But fundamental questions about the makeup of our universe remain unanswered, and many of the proposed solutions lie beyond the reach of the current LHC. A successor is needed, but as the machines involved get bigger and more powerful, construction and operating costs shoot up, and the need for collaboration balloons. The next supercollider will cost tens of billions of dollars and take decades to build. Given those constraints, there is broad consensus in the particle physics community that there will be only one successor to the LHC—and growing enthusiasm for China’s building it. The proposed Chinese supercollider, at 34 miles in circumference, would be double the size of the LHC, and would be located near the Chinese town of Qinhuangdao at the coastal end of another enormous project of the past, the Great Wall. The Chinese plan is not without its competitors. The other two proposals are Japan’s International Linear Collider, an electron-positron collider, and CERN’s Future Circular Collider, a proton-proton collider located in Europe. But China’s is the most ambitious, with the clearest political and financial backing. Breaking ground as early as 2021 and starting to take data by 2028, the Chinese behemoth aims to be in operation until 2055 and define the frontiers of particle physics for the next two generations. Exciting as the scientific prospects may be, further questions about the Chinese proposal should be raised—questions about politics that scientists are not accustomed to posing and that many physicists have been worryingly dismissive about. Collider experiments epitomize the international cooperation, transnational spirit, and camaraderie of science. But are those values compatible with an authoritarian state that’s increasingly hostile to foreign ideas at home and which sees science as a tool for national greatness? What influence will the Chinese Communist Party have on the scientists and their work? How will the technology developed through the project be controlled by the state? Will security concerns in a paranoid system divide and slow research that could benefit all of humanity? Previous supercolliders have only resided in liberal democracies: one in the United States and two in Europe. Previous supercolliders have only resided in liberal democracies: one in the United States and two in Europe. First proposed by Chinese scientists in 2012, the year the Higgs boson was discovered at the LHC and Xi Jinping took over the helm in China, the Chinese supercollider is the perfect embodiment of Xi’s “Chinese dream” and a unique opportunity for China to lead an entire branch of science within one generation. Although it’s encouraging that the field is growing beyond the Western Hemisphere, Chinese dominance, in the long run, could compromise the essence of particle physics as a science: its status as a global enterprise. Here’s the first problem with the Chinese plan: Authoritarian states breed a parochial national pride antithetical to the cosmopolitan ideals of big science. The senior CAS official I spoke to clearly stated that the level of international collaboration currently enjoyed at LHC experiments will not be achievable at the Chinese supercollider. Chinese investment will cover 70 percent of the cost of construction and operations, and hence China will, quite legitimately, claim leadership positions throughout the project. This concern is shared by the International Advisory Committee (IAC) to the Chinese supercollider project, which stated in its report after the committee meeting in the fall of 2016 that the project “still looks like a Chinese project owned by China” and needs greater international involvement. And there’s no question who these personnel will ultimately answer to. There is a Communist Party branch in every Chinese institution, and the Party has been stepping up its ideological drive on university campuses, demanding direct shares in privately owned tech companies, and pushing for Party building at multinational businesses. Western scientists are given to dismissing the Party presence as a “formality,” but Chinese scientists know that when ideological loyalty and behavioral compliance directly factor into professional advancement and social mobility through “digital Leninism” aided by new technology, the Party branch is never a figurehead, always the real boss. These words echo a document found on CAS’s website titled “Related Knowledge on the United Front.” According to the document, dated August 14, 2009, the goal of the “Patriotic United Front” is to “win over hearts, unite the forces under a grand coalition, and strive together toward the great expectations of the Party and the state.” The document goes on to list the “main targets” for United Front work at the institute, namely people who are not Communist Party members, people returning from overseas and their family members, Taiwanese, and ethnic minorities. An adjacent document under the same “United Front” section lists the number of people at the institute belonging to each of the aforementioned categories and their respective levels of employment. The senior CAS official described the Party branch’s presence at a science laboratory as “similar to psychological counseling services at Western institutions.” But the Party’s counseling service treats not mood swings but any perceived deviations from the Party mandate observed from daily speech and behavior. China has also been making increased efforts to curb academic freedom at foreign universities, including cutting off funding for visiting scholars at the University of California, San Diego, after it hosted the Dalai Lama and the attempted censorship of the Cambridge University Press. It’s not hard to imagine China’s denying access to the supercollider or blocking individual scientists’ career advancement as punishment to institutions that don’t play ball on other issues. While the LHC takes great pride in fostering collaboration among scientists and institutions from countries in conflict—like Russia and Georgia, Israel and Iran, India and Pakistan—every potential collaborator at the Chinese supercollider will have to be fully aware that his or her participation is subject to political criteria and can be used as political leverage by the Chinese state. Science depends on an environment of free inquiry and debate; if academia in China continues along the path it’s taking, that’s unlikely to be a mood that will flourish at the collider. Apart from the presence of Party watchdogs, there are other critical questions about the functionality of the project. Science depends on open access to the Internet, which China is increasingly determined to shut down. I asked the senior CAS official if there will be free and open access to the Internet at the Chinese supercollider. Without elaborating on future scenarios, he acknowledged that there is no such freedom at the existing international collaborations in China and went on to claim that problems with Internet access do not interfere with scientific research. “Difficulties have to be confronted together,” the official said coyly. As a matter of fact, Chinese scientists almost all use virtual private networks (VPNs)—now under threat—to illegally evade their own country’s rules and access services such as Google Scholar. The World Wide Web was originally invented at CERN in 1989 to facilitate information sharing among particle physicists. Can the future of particle physics exist within the Great Firewall of China? Should future generations of particle physicists accept tools of oppression when their predecessors were pioneers in openness and free inquiry? But the most urgent alarm bells should be ringing over the transfer of foreign technology to China. The LHC is located in Europe, but significant fractions of its machinery are constructed in the United States. On the contrary, the Chinese supercollider will be primarily, if not entirely, made in China. As the senior CAS official stated, one of the top priorities in the coming few years before official government green light for construction is to “allocate Chinese companies that have the technology” to manufacture its components. 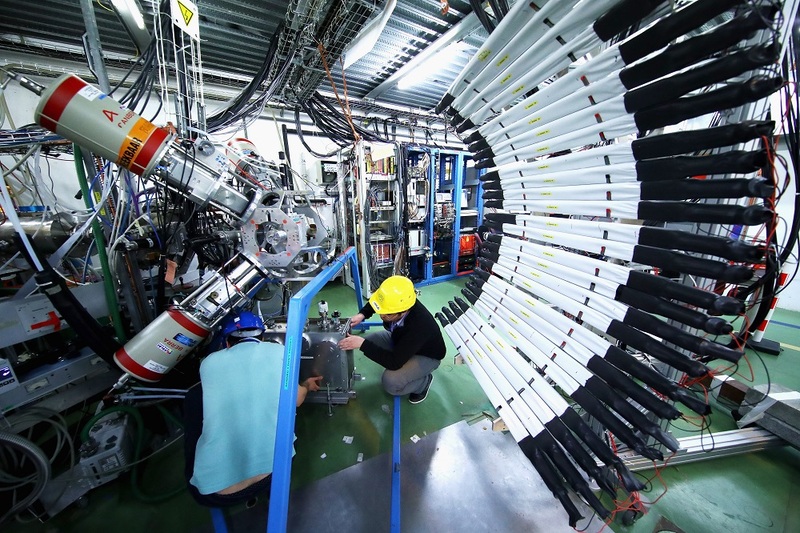 As China has little experience with experiments of this type or magnitude, even with intensive domestic research and development underway, the success of the supercollider still depends on significant input of foreign expertise, equipment, and technology. Evident in the “Made in China 2025” plan launched by Xi in 2015, the Chinese goal is not mere possession of the product but internalization of the technology. China’s hopes to replace foreign technology with domestic ones, its lack of transparency, and poor track record in honoring the terms of licensing agreements make technology transfer to China a concern in terms of both intellectual property and national security. Science projects in China are owned by the state—or, more precisely, they are part of the state. A recent article on the Chinese military’s official website discussed the importance of “civil-military fusion” and listed specific measures including the “construction of a unified platform,” “combining military, government, corporations, universities, and other industrial organizations, to build a nationally unified and well-connected civil-military fusion platform, upon which to further develop tech transfer, start-up incubation, science and technology,” among others. These words should alarm physicists seeking to collaborate with China, given how the scientific breakthrough that split the atom and birthed our profession was immediately utilized by the military to nightmarish ends. While modern-day particle physics as a field of basic research is far removed from nuclear weaponry, generations of nuclear scientists, including many leading figures of the Manhattan Project, have organized and advocated tirelessly for arms control and civilian use of nuclear technology. But unlike their counterparts living in liberal democracies, Chinese scientists do not have a say in how their technology might be used by the state and often inadvertently develop tools that contribute to their own oppression. But unlike their counterparts living in liberal democracies, Chinese scientists do not have a say in how their technology might be used by the state and often inadvertently develop tools that contribute to their own oppression. Any technology intended for peaceful purposes, once owned by the Chinese government, is just as likely to be used for its internal security and national defense. We’ve already seen big data being repurposed as a tool of mass surveillance in China. Will technology developed to unlock the deepest secrets of the universe end up realizing dystopian nightmares? Ian Shipsey, a professor of physics at Oxford University and also a member of the IAC, shared the optimism that the government would be flexible in enforcing its rules, including the possibility of creating a “special zone” for the supercollider where web access may be unrestricted, and the experiment may serve as an “open window” for China. Such optimism is admirable, but it cannot be based on willful ignorance. The bitter truth is that engagement with China has not brought reciprocal liberalism. From the handover of Hong Kong to the country’s membership in the World Trade Organization, similar hopes have been expressed time and again. The Chinese government has proved in each instance its ability to make China richer and less free and in the meantime, through stealth influence and explicit coercion, bend the existing liberal democratic world order toward its favor. “Look, I’m not thrilled [with the political system in China]. In a parallel world where China is free, that is preferred,” Arkani-Hamed acknowledged. Nevertheless, he went on to state that “democratic systems make it harder to do long-term things” and that the “top-down system” of China can be more efficient in decision-making. When asked if the Chinese supercollider indicates a future where particle physicists must conform to the rules of the Chinese state for professional survival, Arkani-Hamed made an interesting suggestion. “You should have asked me, ‘If Tiananmen 2.0 happened, would non-Chinese scientists at the experiment go join the local protesters?’ And I probably would,” he said. Arkani-Hamed fled Iran as a child with his family after his father, also a physicist, wrote an open letter denouncing Ayatollah Ruhollah Khomeini’s closing of universities. But his hypothesis, well-intentioned as it was, reveals a deeply simplistic, caricatured understanding of state oppression. True terror and totalitarian control come after the tanks have left the square, when blood is wiped off the streets, the history books, and the people’s collective consciousness, when a date becomes taboo, and when a simple question confirming the existence of the Party office exposes the Achilles’ heel of a grand project. “Politics is too sensitive. It could kill the project.” These words, repeated by the senior CAS official in an effort to intimidate me, spell out the fear inside the system itself. Like economic reform, scientific research is favored by the Chinese state only when its practice and outcome help strengthen the Party and can be crushed in an instant when any element—ideological, professional, or personal—runs counter to a political mandate. From the Anti-Rightist Campaign in the late 1950s to the decade of madness called the Cultural Revolution, scientists were among the most persecuted groups in China. Fields as fundamental as astrophysics and cosmology were risky business through the 1970s and 1980s as they were considered contradictory to Marxist philosophy. Today, entire branches of social science in China are censored and whitewashed, and their researchers, Chinese or foreign, are under constant surveillance and harassment by the security state. Astrophysicist Fang Lizhi’s pro-democracy activism in the 1980s led to not only his own demotion and exile but also years of reduced funding and political pressure at the University of Science and Technology of China, where Fang served as vice president. The most optimistic choose to believe this strongly anti-science ideology is a thing of the past, despite the fact that China is still ruled by the same Party. The most selfish willfully overlook government interference in academic disciplines other than their own, despite the fact that the academy is not free when any study is not free. The most obedient self-censor and never question, let alone defy, the Party. “Science and politics cannot mix,” they tell me, despite the fact that scientists have often protested political restrictions in the West. Astronomers boycotted a U.S. conference in 2013 when NASA denied Chinese scientists from participating for security reasons. Last year saw a massive political awakening of scientists across the United States, who are organizing marches and running for office. While Western scientists have regularly held their own governments accountable to liberal democratic standards, the ones I spoke with on this topic seem to have readily accepted the assumed-to-be minor restrictions on Internet access, speech, or movement as “Chinese characteristics”—a small price to pay if the money and equipment are there. “If the U.S. government puts up $10 billion to build the next collider, but it comes with a Party committee office, I would say absolutely not!” Arkani-Hamed said. But in China, “it’s not a hill worth dying on.” Many of my colleagues, Western or Chinese, asked me about my priorities and whether I cared more about physics or human rights, as if these pursuits are mutually exclusive. As China becomes the world’s second-largest economic power and increases its military might, it has shown growing ambition to rewrite the playbook through new initiatives and alliances, including the Asian Infrastructure Investment Bank and the “One Belt, One Road” program, aptly described by political scientist Ian Bremmer as the Marshall Plan minus liberal democracy. International collaborations in particle physics have always carried geopolitical significance. When Ukraine joined CERN as an associate member state in October 2016, its ambassador remarked that the occasion was an important step in Ukraine’s European integration. As the United States and Europe retreat from global leadership for a lack of political will more than a shortage of capital, the Chinese supercollider proposal is another example of how Chinese investment can press the rest of the world to play by Chinese rules even if they run counter to liberal values or professional ethics. The correct response from the international community at large should not be blanket rejection of Chinese collaboration based on a Cold War mindset or ethnic discrimination against scientists of Chinese heritage. Nor should it be blanket acceptance of Chinese rules as entrance to the game. When the Cambridge University Press submitted to Chinese state pressure in censoring its journals in China, the academic community pushed back with threats of a boycott that led to the reversal of the censorship. At a point when Western technology, expertise, and funding are still critical to the success of the Chinese supercollider, the particle physics community has a professional and moral obligation to demand full cooperation, transparency, freedom, and independence as conditions for its engagement. Such principled actions do carry a degree of political and professional risk, but compliance never guarantees safety in the complex and opaque Chinese system, and the consequences of complacency can be much more serious. Nature carries no political ideology nor should the interpretation of nature. The laws of physics do not come with Chinese characteristics and nor should the practice of physics.